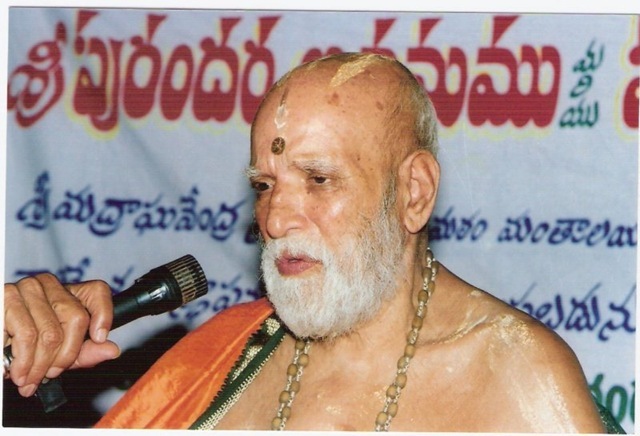 My beloved guruji ,the PEETHADHIPATI of SRI RAGHAVENDRA MOOLASAMSTHANA MANTRALAYAM passed away yesterday . I present the following couplet in my Guru’s charanarvindam and relate my close encounters with him and influence on my life. Havyavahan samah tejam Hrudabji Prakashit narasimham ! Raghavendraamsha sambhuutam SriSushmeendra Gurum Bhaje!! Beloved Guruji had always been a guiding force in my life . Whenever I was in a state of despair , in whichever city I would be ,Swamiji surprisingly would be in the same city to offer me guidance ,good wishes and new enthusiasm to continue. 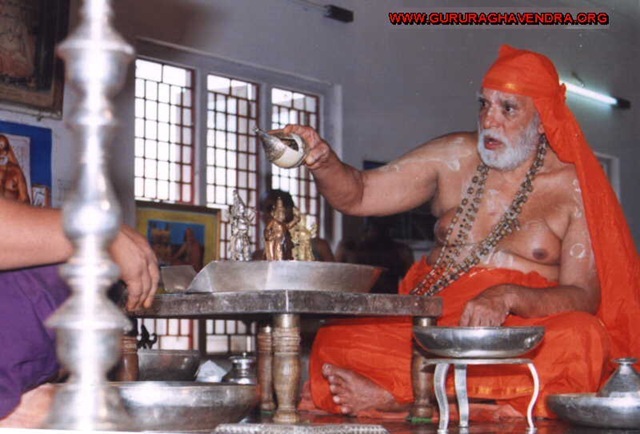 For as a many as three times I faced sabotage in my life , surrounded by enemies as I was , my only hope would be Raghavendra swamy mutt , where would spend hours to seek solution , freedom from the web of enemies . Everytime Swamiji would somehow appear in that city as a part of his spiritual trip and my encounter and his darshan and Divya MOOLRAMA POOJA would immediately put my mind into calmness under the most impossible situation and I would always always escape enemy designs . I had completed my engineering from one of premier institutes of India in computer Technology , I had no wish to get a job for myself , I wanted to do something different ,My Father had given a clear dictat not to enter foreign land , Local industry was not aware of computer design and analysis and only thing Indians were attempting were a coding job , but I had three research papers to my credit , WHat should be my first steps in life ? I told my mother , that I am taking a break and going to mantralayam to seek answers for my future! My Father great astrologer as he was , has made note of tapasvi yoga in my horoscope and my mother always gets jitters when I mention I am going to Mantralayam . somehow I convinced her my aunt took the responsibility of bringing me back in case i don’t return .This time I wanted to experiment and put to test my spiritual endurance ,hence I left Hyderabad with only dhoti and shalya and only one way bus fares towards mantralayam and nothing else [ My contention was only Lord will orchestrate my return and i will only concentrate on my next immediate steps ,orders to be taken directly from the Seer] .I spent next ten day on the altars of mantralayam sleeping on the temple doorsteps on the ground ,fasting without taking even water was a usual practice in the house.BUt as friday was usual fast day , next saturday was ekadashi [ brahmins fast complete 36 hours from dashami night till dwadashi morning] but again sunday was an extra ekadashi and monday was vaman dwadashi a fast again . Thus four days went without water , I had totally dehydrated barely able to move [ think my three hours regular gym practise during college days had come handy in countering the stress] .The fifth day meals seemed like the only endeavour in life ,but somehow it was served at 10 am . The previous fasts had rendered me blank and I had forgotten the very purpose of my visit . There was a congregation of all major scholars , and my dressing was mistaken for one of the participants and as I was seated on a altar without hiring a room , people gathered around me to know few things general about philosophy and slowly about astrology too . NExt few days my airs of being Engineer too vanished I was observing myself being reduced to a rustic fakir. BUt my aim was to know my future .ON the eigth day I met MY VIDYAGURU ASTHAN jYOTHISHI OF MATRALAYAM, he initiated me into a mantra shastra , the next few days I spent my all day half dipped in tungabhadra practising what guruji had given the upadesha . My guruji had completed 10 crores of the japa thus I could easily see the difference the mantra was making on me because of his capacity . NInth day I had a dream of fabulous research [ which gave way for fantastic products later] . I wrote them down on a paper the next morning , presented it to my vidyaguru . Though he did not understand it [ computer science was not their subject, they had all the schooling in the matha pathshala in sanskrit ] ,guruji suggested , Shri SUSHAMEENDRA TEERTHA is guru for all of us ,so lets take his blessings . I was skeptical what a religious pontiff would understand about a computer research , but my traditional upbringing and putting faith in everything uttered by elders forced me to the seer. I placed before him three bunch of papers of three different ideas, Swamiji gazed at it for pretty 15 minutes [ swamiji is known to be not so literate in his pre-sanyas days] , this was surprising me even more , after much afterthought , he flipped away the first bunch and then poured sacred MANTRAKSHATE ,on the other . 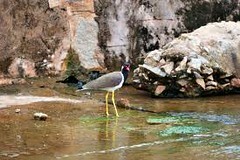 Slowly it was 12th day , my only dhoti and shalya were already mutilated , that afternoon shalya gave way into in the river , I mentally refused to go back . 13th day dhoti edge tore off . now it was a must i acquire a new one or go back . I looked at Swamiji ,he signalled to make a move , but how ? 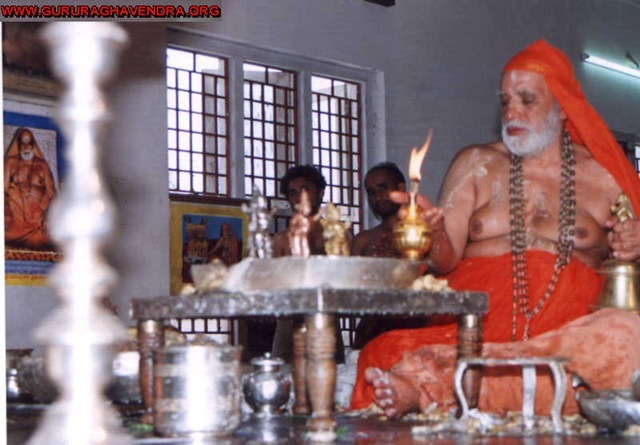 I had nothing to back , i prayed RAghavendra swamy that if something would come by all by itself i would go back else i will sit here on his altar . that evening a trader from miraj came by sat besides me and asked , if I could tell something about his life, I told through palmistry that he was a perfume trader and had two wives , one of whom was untolerable ! tears rolled by his eyes , he then went on to ask many remedies and in the end placed a 100RS note before me , That made up for a ticket to hyderabad , with only dhoti and bear chested , I was a spectacle to watch in the bus. 2. Second time was when in mid twenty I had just about made a installation of a system that was first of its kind in India , and a very big business house wanted to acquire it and my father was against giving it up and I skipped a grand party and gathering given by the business tycoon[ at mumbai’s five start hotel] to announce our merger , i was in no mood to join them , I cooly switched of my mobile phone [ those were the days 16rs /min outgoing call] and went away to Mantralayam without informing anyone , the party went in my absence giving hiccups to my managers and brothers who were co directors were finding it hard to explain my absence . The non merger in business sense was a great mistake in everybodys’ eyes , for me my fathers’ words were more important , I took refuge in Sushameendra teertha alongwith my vidya guru , who reassured me i would never come down in my life .Merger failed but gave way to many enemities. 3. 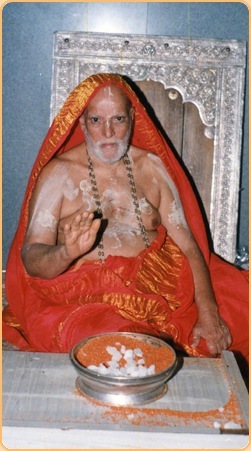 In one of the cases of sabotage from unwanted sources , i had lost everything ,my establishment ,wealth and near dears , I somehow escaped the fatality and reached Jogeshwari, my father had expired by then , and I was trying to find out the whereabouts of my near and dears , just then Swamiji was there and he ordered a pooja to be made on my behalf and many people were given bhojana on account of the occassion , and lo , I dared to go all alone as a lay man to a minister’s house [ ALL my acquaintances had shut door on me on account of fear of goonda forces acting against me], standing outside his house for twelve hours [reciting atharva sukta], by evening I had the previlige of meeting this high profile minister as he descended from his car . HE accorded me a warm welcome and within minutes a huge force was employed to trace the whereabouts of my near and dear the guilty though the most powerful then were brought to book by SHRI SUSHAMEENDRA TEERTHA’s grace. 5. I restarted the whole thing again and at the peak of my days , I visited UDUPI stayed there for 10 days for the purascharane of HARIVAYUSTUTI saptaka and on the eighth day I performed a homa of purashacharne , it was first time full format homa was being done , a seven by seven feet kunda was constructed and homa lasted for four hours . , a convoy from MAntralayam had come down and his disciples notified swamiji was in my native the next day, I rushed to see him , and the very morning as i Reached home , My mother complained of chest pain and was hospitalised in one of speciality clinics ,under observation 24 hours , this was a moment i was desperately in need of assurance from elders or seers. Swamiji was there ,communicating through his eyes , and at the end of aarthi he declared all will be well. Just by Doctor came and assured things were all right. I thanked Swamiji for calling me back to native . MY mother needed more my presence than udipi [ where i had planned to stay few more days]. 6. [I had thought of marrying and settling down ] and again at the behest my vidyaguru And we met SriSushameendra teertha swamiji and this swamiji was in the midst of prayer , as pushpabhisheka was being done to Sri MOOLARAMA at MAntralayam , Swamiji took one rose out the bunch from the feet of RAMA and threw it at me [I was seated at 20ft away] and swamiji blessed with a smile . It seems he had already known the purpose of my visit.I was blessed to have one of the most beautiful women in my life and a wonderful marriage remembered by near and dears for many many years even now. As i write this my mind is unable to accept that he is no more ,This great seer who is the amsha of the RAghavendra swamy himself [ also appanacharya] will always be with us to be beacon light in our lives . When there are benefics in 3rd and 9th house and Ninth lord is in gopuramsa ,one will have upadesha of secret mantra and blessings of a Guru. In 17th century there was a bramhin boy by name venkanna. He had no parents and was living in his uncle’s house. Though being a bramhin he did not have opportunity to study the shastras .Also his guardians were not interested in spending on boy’s education.They had set upon him the task of grazing cattle . The boy was very sad but had resigned to his fate. One day a Great seer by name Shri Raghavendra Swamy [ peethadhipati of Madhvacharya’s Mool samsthan ,and author’s ishta guru ,beacon light of Madhva school of Vedanta , Kalpavruksha to many devotees in the country] came to the village . Everyone rushed to take the blessings of the seer . Shri Raghavendra was known to grant all the wishes of his devotee . He was known for his magnanimity, merciful and quick to grant boons . Venkanna too went to the Acharya and after a sashtanga namaskaar ,and expressing his desire to study , gazed at the guru for some heartening words. But His holiness called the boy and uttered a upadesha in his ears and guided the boy to “remember him in the time of distress and chant the mantra”. Venkanna keeping faith in the Guru went about grazing cattle as usual. Many days passed by ,the boy had grown adult but yet was uneducated. One day Nawab of Adoni was passing by on a war trail . His troops were tired and reluctant .A terrible battle was anticipated. Just then a messenger came by with a written message in sanskrit . Unfortunately none in the camp were educated. All the troops were unable to decode the message . Nawab happened to see the Bramhin boy grazing cattle in the ground nearby . Now it was foregone conclusion that bramhins were adept at sanskrit . Thus he ordered the boy to be brought before him.As the soldiers presented the Venkanna before the Nawab . Nawab requested him to read out the message for him. VEkanna as illiterate he was , pleaded he did not know to read and write. This angered Nawab ,he excalimed ” Bamman ka bachcha aur padhna nahi ata ;Bewakoof banata hai ” He threatened to kill him if he does not read out the message. Venkanna closed his eyes remembered the Guru Shri Raghavendra and chanted the mantra to save himself . Alas !!!! Nawab was overwhelmed ,seeing the good omen in the bramhin he made him his Diwaan . Venkanna’s life changed in a moment ,not only was his desire of studying fulfilled but also he achieved the notable post to serve his people and the GURU. 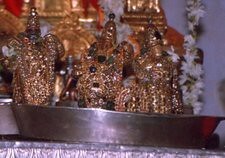 Venkanna having witnessed Guruanugraha in his life, continued with faith and worship in MoolRama of ShriRaghavendra swami. 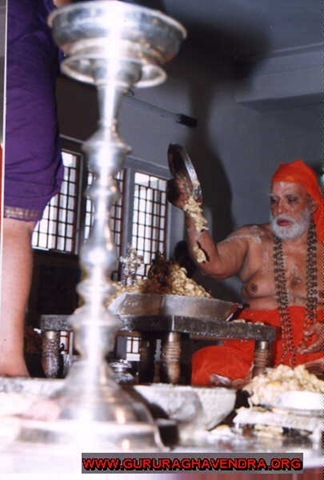 Many years later Swamiji came to Adoni ,Venkanna was overwhelmed and decided to give royal welcome to the Guru. 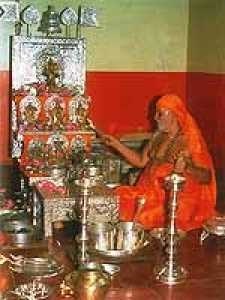 He took permission from Nawab and as a routine expressed the mystique that is Guru Raghavendra . He obliged but at the same time decided to test the Swamiji . Diwaan was anxious and nervous at the prospect of possible insult that would come Guru’s way. but there was no solution to his dilemma . He remembered Guru and chanted the mantra . Something in him assured that everything would be allright. Next day Swamiji was accorded Royal welcome. Nawab himself came to pay his respect ,but Nawab had a plate full of nonveg covered and presented it to the Swamiji to accept it to be offered to Lord Ram that he prays. Swamy Raghavendra took water from his kamandalu and sprinkled it on the plate to purify it as ritual before offering to the Lord Rama . Lo!!!! when plate was uncovered it was full of fruits and flowers !!!!!!!! Nawab was taken aback ,he was quiet ashamed and at the same time was afraid that if Swamiji is outraged than he may very well turn his kingdom into null .Petrified he offered to donate land and riches to The Saint . He offered many well nurtured lands with plantation and agricultures and mines. But Shri Raghavendra swami refused to take them but as a token gift he requested him to donate the barren lands of Manchala village. Nawab donated it along with lots of riches and arrangements to establish the mutt there at manchala . This is the modern Mantralaya on the banks of Tungabhadra river in Adoni taluk , Kurnool District Andhra pradesh . Swamiji took jeeva asampragyat samadhi in this place is still present in th Brundavan at Mantralayam blessing his devotees . Mukopi yat prasadena mukund shayanayate !RajRajayate rikto Raghavendram Tamashraye! !